My demo went really really well! Posted by feorlen on 31 May 2009 at 8:46 pm under admin. 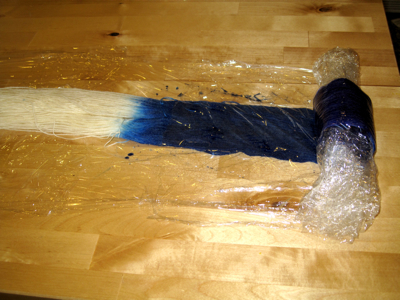 Posted by feorlen on 30 May 2009 at 5:28 am under events, spinning, weaving. 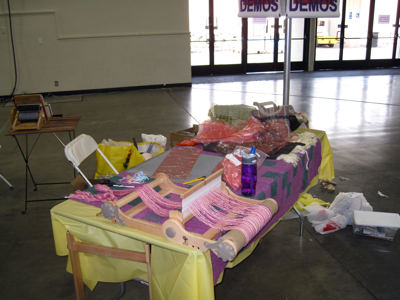 The Maker Faire stuff is coming in and this week I got the loom we will be using. It’s an Ashford Knitters Loom, a small folding rigid heddle loom. It took about 10 minutes to get it out of the box and put together both the loom and the stand. It’s clearly a beginner’s loom, plastic parts keep both weight and cost down. But it’s nicely finished and quite serviceable for small scarves, bags, table runners and so on. It comes with a 7.5 dent reed and you can get several others. Included with the loom is a warping peg to measure warp by looping your yarn through the reed, around the peg and then the back beam, with both loom and peg clamped to solid objects. This is a simple variant of and old technique, using a warping drum to maintain tension while winding. After you beam the warp, you pull every other end out of the slots in the reed and put them in the holes (like threading back to front.) I haven’t tried it yet, but it seems simple enough. My first thought was that I’d replace the plastic holding rods to the beams with cords as I wonder if the cable tie like things snapped into the beam might pop out eventually. I’ve had my warp come undone during weaving and it’s a whole lot of no fun. The other thing is how much warp can you actually get on it, and for anything more than the recommended 2 yards I think I’d prefer the old-fashioned way. Of course, I’m not new to this weaving stuff and someone who is just getting started wouldn’t even know to consider it. Which is just as well. It is nice that it comes with clamps, as there is no way you will get a good warp on any tiny loom without something holding it down while you beam under tension. The warping instructions tell you to have a friend hold the warp while you beam, although if you look online there are directions for doing it on your own (which is most likely in my opinion.) 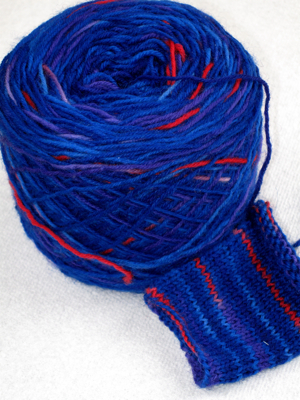 Fortunately for short warps with typical knitting yarn, tension isn’t a huge deal. This weekend I’ll try putting on a warp and report back on how that goes. Posted by feorlen on 16 May 2009 at 7:51 am under weaving. I spent the weekend in Ottawa and while blowing off some Saturday afternoon conference sessions I wandered into an indie craft fair: Tarts N’ Crafts. It was your basic assortment of crafters, sponsored by a womens’ art and music group. There was candy, snarky screen printed clothing, stuffed toys, recycled jewelry, handbags and so on. 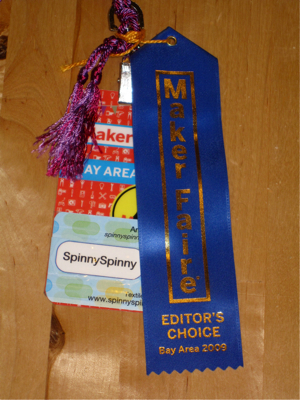 Only one spinner, who had some chunky handspun yarn and knit items. It generally isn’t my sort of stuff, but I do like to see what other people are interested in. And I randomly found it walking around the city in the rain. Posted by feorlen on 11 May 2009 at 6:39 pm under events.